The actress and singer Vanessa Williams received the “Global Gift Excellence Award” for her continuous contribution throughout her professional career to various philanthropic causes. 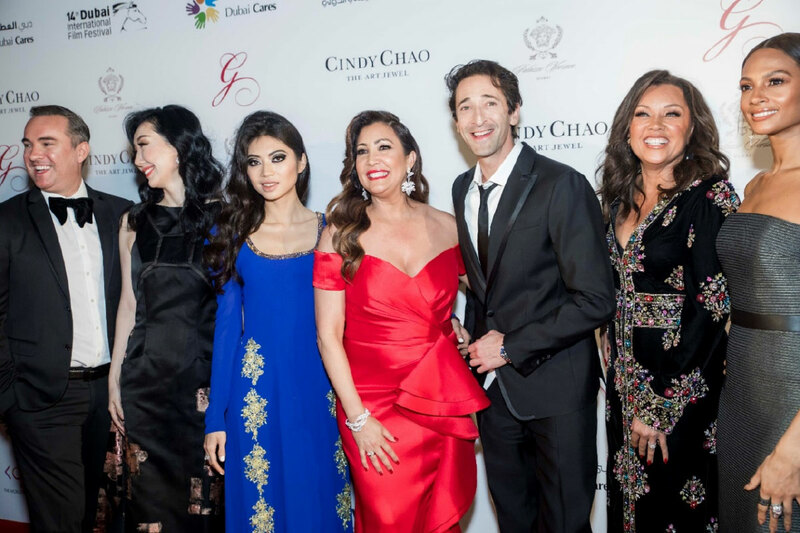 The V Global Gift Gala, Dubai, presented by Cindy Chao The Art Jewel, hosted many international stars such as Oscar-winning actor Adrien Brody, British singer Alesha Dixon and Hollywood actress Vanessa Williams among other stars. During the live auction, guests were able to bid for exclusive experiences and items, including a painting by Oscar-winning Hollywood actor Adrien Brody, a bespoke piece by famed British artist Sacha Jafri and ‘Ruby Sunflowers’ – sublime jewellery donated by Cindy Chao The Art Jewel were the most sought after objects of the night. Dubai, December 9, 2017. For the fifth consecutive year, Maria Bravo united the most committed philanthropic community in Dubai, to celebrate the Fifth annual Global Gift Gala, recognized as the official charity gala of the Dubai International Film Festival (DIFF), held at the Palazzo Versace Hotel, with more than 400 attendees. The host of the charity gala, Maria Bravo, who wore jewellery from Cindy Chao The Art Jewel, presented the singer, model and British television presenter Alesha Dixon as Honorary Chair of this fifth edition. Dixon has been a long time supporter of Global Gift, having attended previous events in London, Sardinia, Ibiza and Marbella, helping to obtain funds for beneficiary foundations. Presenting the event, was well-known British television and radio presenter Tom Urquhart, who has resided in Dubai for years and gave way to the various performances that added the musical touch to the magic evening. The Puerto Rican singer Luis Fonsi had everyone on their feet with the world-renowned song “Despacito”. Asian soprano Seia Lee, who also supported the foundation at the Global Gift Gala in London, was dressed with a beautiful design from the couture brand Gyunel Couture. Dubai College Choir and Symphony Orchestra of the United Arab Emirates completed the musical performances for the evening. The local philanthropic community was represented by the director of the Dubai International Film Festival (DIFF), Abdul Hamid Juma and the director of Dubai Cares, his Excellency Tariq Al Gurg, who once again showed their support for the Global Gift Foundation. An exclusive auction was held for the fifth consecutive year where attendees were able to bid for luxury items, such as an original gold engraving by Salvador Dalí, a luxury getaway in the Royal Mansoor Marrakech, listed by Conde Nast Traveler as “best spa in the world”, an apartment at the resort Cocobay Da Nang of Vietnam donated by Cocobay or the assistance to the week of Paris fashion donated by Gyunel Couture , both official sponsors of several Global Gift Galas around the world. The exclusive jewel, ‘Ruby Sunflowers’ earrings donated by Cindy Chao The Art Jewel valued at over 150,000 USD were sold to an anonymous bidder, as well as the works donated by the Oscar-winning actor Adrien Brody and British painter Sacha Jafri were the three most valued items in the auction and best sellers. Just one day before this charity event in Dubai, the actress and activist, Eva Longoria Bastón, fulfilled her role as co-host of honor, along with Ricky Martin, of The Global Gift Gala, Miami, for the benefit of those affected by the Hurricane Maria in Puerto Rico. The NGO Dubai Cares, as part of the Mohammed bin Rashid Al Maktoum Global Initiatives, works to provide children in developing countries with access to quality education through the design and financing of integrated and sustainable programs. In recent years, Dubai Cares has successfully launched educational programs that reach more than 16 million beneficiaries in 45 developing countries. The Global Gift Foundation, organizer of the gala, will contribute to the causes afore mentioned as well as allocating funds to the refurbishment works of the Casa Global Gift of Marbella, a multifunctional centre that will offer specialized help and material adapted to children suffering from rare diseases as well as offering support to their family environment. Maria Bravo thanked the support of the international community that reunited in Dubai and stressed that “100% of the funds raised tonight will go to beneficiary projects that will help change the lives of women and children around the world”. Harmony House India, one of GGF´s beneficiaries is an NGO based in Gurgaon, on the outskirts of Delhi, India, which has transformed two villas into full-time community centres for women and children living in slums, where education is offered, food, medicines, hygiene services and social services. Likewise, Global Gift Foundation will contribute part of the funds to a charity project led by singer Luis Fonsi, whose objective is to provide emergency supplies, food and water to the victims of Hurricane Maria in Puerto Rico as well as re build areas that have been destroyed by the storms. After the success achieved at The Global Gift Gala in London and Dubai, the Foundation will continue its philanthropic work, collaborating with humanitarian projects of a local, national and international nature developed by fiscally responsible NGOs.